Can you trademark a holiday? Disney learned the hard way this week it’s best not to try, as the studio’s attempt to register “Dia de los Muertos” with the U.S. Patent and Trademark Office was met with vociferous criticism. The company has since withdrawn its applications. On May 1, the Walt Disney Company quietly filed 10 applications for “Dia de los Muertos” toys, cereal, jewelry and more, reported the Los Angeles Times, in anticipation of merchandising opportunities associated with its upcoming animated Pixar movie about the Mexican holiday. The public was quick to condemn the move, however, and a Change.org petition that went up on Tuesday has more than 20,000 signatures as of this writing. via Disney kills ‘Dia de los Muertos’ trademark bid – L.A. Biz. Scientists said Wednesday that flu infections were rising among pigs raised for slaughter on farms in south and southeastern China, also plagued by bird flu. And the risk of spillover to humans was “constant or growing”, according to one of the authors of a study published in Proceedings of the Royal Society B.
Pigs are an important source of new human strains of influenza A, such as the 2009-10 H1N1 pandemic that emerged in Mexico and infected an estimated fifth of the world’s population. Pigs can act as a “mixing vessel” in a process known as reassortment, brewing new flu strains from swine, poultry and human viruses in areas where they live in close proximity. Such new hybrids can be deadly — tens of millions of people died in flu pandemics in 1918, 1957 and 1968.
via AFP: Flu infections rising among Chinese pigs: study. “Instead, disconnecting the market network should be achieved through the daily disinfection of live bird markets and of the vehicles leaving them,” said the study. Daily disinfection was shown to reduce the median epidemic size, or the fraction of contaminated markets, by 80 to 89 per cent, said the study. Disinfection every two days was less effective, reducing the media epidemic size by about 30 per cent. The benefits of such a system include low costs and easily collected data about traders’ movements, said the study led by Guillaume Fournie of the University of London. via Basic disinfectant could halt bird flu spread — Study – BorneoPost Online | Borneo , Malaysia, Sarawak Daily News | Largest English Daily In Borneo. A 21-year-old accidentally shot his 18-year-old brother in the face in Houston, Tex., early Tuesday. The men were in separate rooms of the home when the older brother was fiddling with an AR-15 rifle. He reportedly didn’t realize it was loaded, and a round struck his brother in the face. He is expected to survive. There’s no word if any charges will be filed. via The Gun Report: May 8, 2013 – NYTimes.com. JERUSALEM (Ma’an) — Israel forces on Wednesday released the grand mufti of Jerusalem but police said they intended to pursue an investigation into the Palestinian religious leader. “The investigations about mufti Mohammed Hussein will continue,” an Israeli police statement said. Hours earlier Israeli intelligence officers had broke into the mufti’s home in the Jabal al-Mukabbir neighborhood of East Jerusalem and took him to the Russian Compound detention center. “At 8:10 a.m. two vehicles from Israeli intelligence arrived at our house and detained my father, taking him to the Russian Compound detention center for interrogation,” one of Hussein’s sons told Ma’an. An Israeli police spokesman told AFP that the mufti was being questioned on suspicion of involvement in a “disturbance” at the al-Aqsa compound on Tuesday. “Some chairs were thrown at a group of Jews on the Temple Mount,” which Muslims refer to as al-Haram al-Sharif, Mickey Rosenfeld told AFP of the previous day’s incident. via Israel releases grand mufti of Jerusalem | Maan News Agency. This piece was published yesterday in The Globe And Mail, here is another copy in case you missed it. On late Saturday, Pope Tawadros II led his first Easter Mass as head of the ancient Coptic Christian Church in Egypt by praying for security and prosperity in the country. 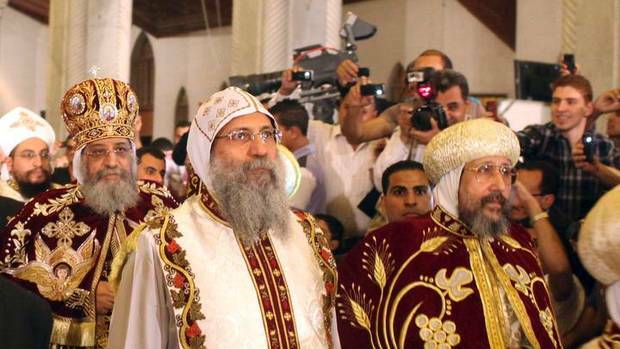 It was the most important event of the year for Egypt’s Christian minority. Many Muslims attended the service, including various figures from the opposition parties. However, President Mohamed Morsi and Prime Minister Hesham Qandil were conspicuously absent; their Muslim Brotherhood government effectively snubbed the mass by sending a low-level token representative – the country’s housing minister.